LBD:MA meets the needs of educators in K-12 schools, community organizations and out-of-school-time programs across the state. We look upon our client schools as partners in the design-education process. This process often begins with Professional Development Workshops, followed by Children’s Design Workshops. Programs sometimes start with one grade level, and expand to other grades in subsequent years. For helpful information about funding our programs click here. LBD:MA master teachers and volunteer architects work directly with teachers and their students, delivering architecture and design programs that meet curriculum needs. Programs are based on the design process as outlined in the MA Curriculum and Common Core Frameworks, and incorporate learning standards in mathematics, science and technology/engineering, social science, English language arts and the visual arts. Click here to see the range of LBD:MA Children’s Design Workshops. 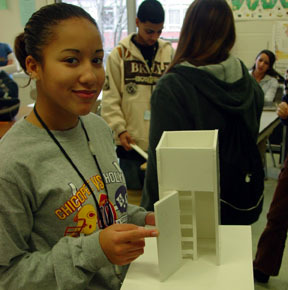 A range of LBD:MA workshops can support efforts to initiate or to continue K-12 architecture and design education programs. Check our home page to view current Professional Development opportunities. In this 10-hour workshop, teachers develop ways to use architecture and design themes to teach what they need to teach through hands-on, interdisciplinary, problem-solving activities. Using practical methods and a wealth of resources, participants are introduced to a range of architecture and design projects aligned with the MA Curriculum Frameworks in mathematics, science and technology/engineering, history and social science, visual arts and language arts. Workshops of 10 hours in length (10 pdp points) or shorter (certificates of attendance awarded) are available on specific program themes. For example, we can provide a district-wide workshop on ways architecture projects connect learning in mathematics and the visual arts; a K-5 workshop on the Box City community-building program; or a single-grade-level workshop on science and technology/engineering concepts inherent in the design process. Please contact LBD:MA to discuss workshop ideas. Guided by the design process used by engineers and artists alike, teachers will enjoy becoming designer themselves – redesigning a classroom, creating an outdoor learning space; and drafting floor plans for a dream house. They will increase their awareness of architecture through local walking tours, and develop projects that will help students use their community as a focus of study. Teachers will see how authors and illustrators of children’s books describe architecture in their work, and find ways to encourage students to write about the architecture projects that they create. They will plan and build 3-D scale models, combining those models at course’s end to become a scale model city. The “Architecture and Children” curriculum model is the course guide, including topics such as: the studio design process; plans and perspectives; bridges and structures; design in nature; form in architectural history; houses in literature; landscape and schoolyard design; walking tours and city planning. Teachers completing this course will know the benefits of teaching core subjects through student-centered design projects; and will have a wealth of resources and practical hands-on experiences upon which to build. For pricing and more information on Professional Development Workshops or Children’s Design Workshops, please contact us.